Gion Kawakami is in the very center of Gionmachi, straight west down Hanamikoji Dori, in the middle of a quiet street called "Nishi Hanamikoji Dori". Our premises, a building over one hundred years old, rebuilt from a town house into our current establishment, is overflowing with history from the Taisho Era. 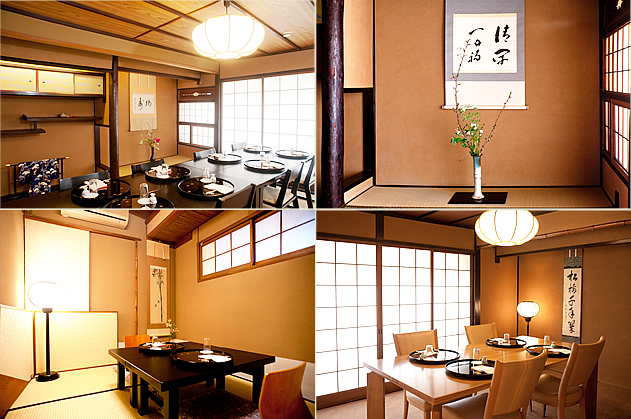 Here you can truly enjoy the spirit of old Kyoto, in the little household atmosphere found only in Kyoto townhouses, and in the style and elegance unique to Gionmachi.